This is an effort to explain some of the ratings that are found in brochures, manuals, and other stove company literature, and how they relate to the real world expectations of what a stove might do in YOUR installation. This discussion is mostly targetted towards wood stoves and inserts, though some may be useful for those considering pellet stoves or other types of heaters. The key thing to remember is that most of these numbers are of limited value, many seem to be as much a product of the marketing department as they are a product of the engineering department, and have only a distant relationship to the "real world." EPA Ratings (x.yz g/hr) - The EPA has required most wood burning appliances to meet stringent limitations on particulate emissions since the late 1980's, with defined limits set for Catalytic and Non-Catalytic stoves. On the theory that a cat stove's performance will degrade more over time as the cat wears out, but the non-cat will maintain steady performance, the initial limit for cat stoves is lower than for non-cat stoves. The number given is the actual stove performance during an emissions test run. It is important to note that these emission numbers are generated using a predefined load of fuel, burned according to a specified procedure which bears very little resemblance to the way that the stove is likely to be burned in the real world. 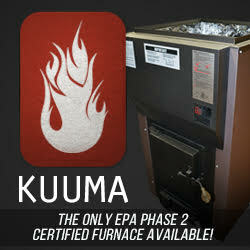 Some People have suggested shopping for a low-emmissions stove, however even the EPA states that the emmision numbers are not reflective of actual burning experience, and SHOULD NOT be used as a basis for comparison shopping. While it is certain that an EPA stove operated properly, and in good repair will burn FAR cleaner than a non-EPA stove, there is no evidence that a stove's performance in the lab will match it's performance in the field. However there is considerable evidence that stove operation, wood choice, and stove maintainence has a great deal of impact on how clean a stove will burn in the field. Thus those wanting to burn "green" are best off to not worry about a stove's test numbers, beyond choosing an EPA listed unit, but instead to focus on their burning techniques, using properly dried wood, and keeping their stove in good working order. AREA HEATED (n square feet) - Most stove literature will have a reccomendation about the size of the area that the stove should heat. Usually this is accompanied by a lengthy disclaimer about the variables involved. The problem is there is no such thing as a "standard house", a "standard climate" or even what "heated" means. Each stove company has their own definition of what these things mean, and usually doesn't specify what they are beyond general terms. Thus each company will have it's own ratings and comparing stoves from different companies is difficult at best. The relationship between the stove company's house and your house is also difficult to predict. The one area this number can be useful in is comparing different stove models put out by the SAME company. HEAT OUTPUTS - BTU/hr, Max. BTU, Avg. BTU, etc. - These numbers are legitimate, but don't have a context to base comparing them on. The way that a stove is operated can have a tremendous difference in the way it puts out heat, so often the the stove is operated so as to produce the numbers that marketing thinks will look best in the sales literature. BURN TIMES (n hours) - A number with lots of flex - influenced by the way the stove is operated and the type of wood used, it also lacks definition, what is the end point - where the stove temp goes below useful heat production, enough coals for a restart, or merely able to find a glowing ember in the pile of ashes? At best it is usually difficult to achieve the burn times claimed by Manufacturers, reducing the claimed times by about a quarter if burning oak and other high BTU hardwoods, or a third when burning softwoods will often get closer to the real world results. FIREBOX SIZE (n cubic feet) - This is a hard number, marketing can't really change it, and it sets the range of possibilitys for all the other numbers, aside from the emissions rating. A given size load of wood contains a certain total number of BTU's heating potential - exactly how many depends on the type of wood, but you CAN'T get more than that total from a given load. However the amount of heat you get at any given time depends on HOW you burn the wood, it can be burned quickly giving a lot of heat for a short time, or slowly giving a little heat for a long time. However you operate the stove, the total amount of heat released will be the same for a given load of wood. The size of the firebox determines how much wood you can get into the stove. The density of wood varies, which changes the amount of heat potential per load (the reason hardwoods are preferred over softwoods) but more wood of any given type will provide more heating potential, and vice versa. In practical terms, wood will only burn so fast, so more wood will also give longer burn times, and it has limits about how slowly you can burn it so a larger stove will tend to produce more heat, but more importantly, a large stove, if burned hot, will produce more heat than a small one, or if burned slowly will produce about the same heat for longer. A large stove can also be burned cooler by simply putting less wood in it at a time. In other words, you can expect similar performance from stoves with the same size firebox, despite what the other numbers in the literature might say. This leads to the suggestion that you start your stove selection process by determining the size firebox you need, and then choose from among the models with that size firebox for your other criteria such as material, style and so on. 2.5 - 3.0 cu. ft - 7-9 hrs - this is the size generally considered the minimum for an "overnight burn"